New British cycling star Evie Richards believes Belgian rival Femke Van den Driessche should be banned for at least two years for mechanical doping. Van den Driessche became the first rider to be caught with a hidden motor at the Cyclo-cross World Championships U23 race in Belgium last month. She faces a minimum six-month ban but Richards, who won the race, wants more. "Six months is pretty short as it's only a season off the bike - I think a couple of years," said Richards. "But because she is such a young age I think there should be more penalties for the coaches and support team around her. 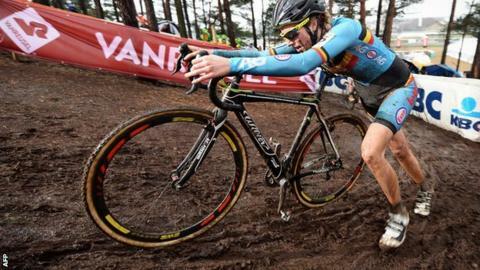 "Belgium is so into cyclo-cross that it's quite upsetting there wasn't the right support around her. So I think the penalties should not just be on her." The International Cycling Union (UCI) found the motor in the seat post of 19-year-old Van den Driessche's bike at the end of the race in Zolder. She has denied knowing it was there, claiming she sold the bike to a friend last year and he had joined her in a practice session on the course a day before. A team mechanic had then picked the bike up, thinking it was hers, cleaned it and put it in the team truck ready for the race. The UCI, however, has sent the "technological fraud" case to an independent disciplinary panel which is expected to meet in the coming weeks. As well as the minimum ban of six months, Van den Driessche, the Belgian U23 cyclo-cross champion and pre-race favourite in Zolder, could be fined at least £14,000. The scandal has overshadowed what was a superb performance by Richards in her first cyclo-cross race abroad. The Malvern-based 18-year-old won a silver medal in the junior race at the Mountain Bike World Championships last September and had only started riding cyclo-cross (a fast, muddy, cross-country-style event on road bikes) in England this winter to prepare for the 2016 season. "I was doing it for training, really, as it's better than the (indoor) turbo," said Richards, speaking to BBC Radio 5 Live's Bespoke programme on Thursday. But she became the British U23 champion in mid January, before claiming a convincing win in the inaugural U23 women's race at the world championships. Richards did not actually hear the full details of the mechanical doping controversy until the morning after the race and admitted that her initial reaction was shock because she did not think mechanical doping was possible. "But I also felt sorry for her because she's only 19 and must have been under a lot pressure to perform to resort to that," she said. "I thought it was quite sad because at 18 my objective is to have as much fun as possible, but the UCI has done a really good job because cheating is just unacceptable." You can hear more from Richards in Bespoke's winter training special podcast - also featuring interviews with Chris Froome, Giant-Alpecin's Chad Haga and One Pro Cycling owner (and ex-England cricketer) Matt Prior.